Aveda's deep conditioning colour conditioners and colour shampoos are made with pure flower and plant essences. is not paid or sponsored, and is my honest opinion on the product. 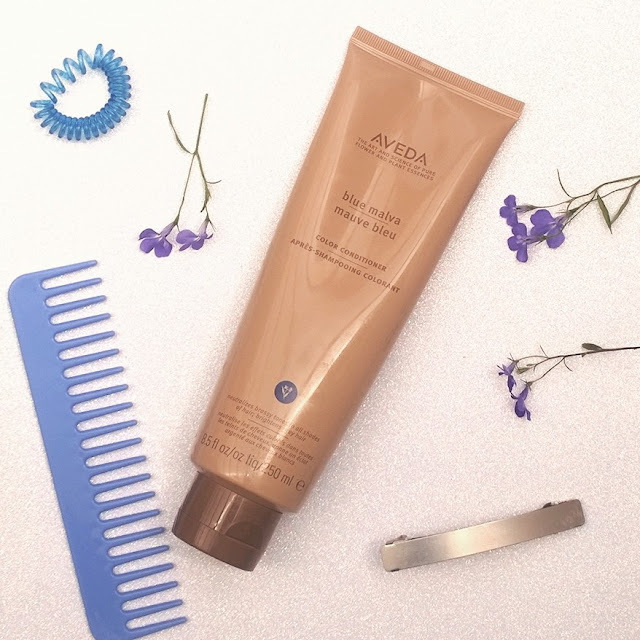 Aveda's Malva range of colour shampoos and conditioners include this one, which is Blue Malva, to neutralize brassy tones in all shades of hair, but predominantly for white, grey and blonde hair. There is a yellow, for golden warm blonde shades, called Chamomile, a rich brown, called Clove, for light to dark brown hair, Madder Root which is red, suitable for red and brown hair, and Black Malva for dark brown and black hair. The conditioner, like all the products in Aveda's range which includes skin care, makeup and perfumes, is not tested on animals, and is made from plant essences and natural ingredients. Aveda has a strong ethic towards responsibility for the environment and giving back to society, and has been cruelty-free since it's beginnings in 1978. Now I can't pretend that all the products in my drawer carry that same good, sound provenance, but I do find that I'm increasingly drawn away from purchasing the more 'high street' synthetic, chemical laden products and towards products produced by companies with a conscience when it comes to our environment, our animal friends, and their own workers. I'm also not a person with a huge amount of disposable income to splurge on skin and hair care, cosmetics and the like, so I could probably be forgiven for sticking to purely high street stuff, but in this case that has proved to be a false economy for me. Paying out a bit more for my conditioner and the other Aveda products that I use, makes me that much more conscientious when I actually use them, and this for me is part of caring for the environment, using a bit less, but better quality. The superior result helps too! Even without the colour effect, this conditioner is a cut above anything else I use on my hair, apart from the other Aveda conditioners I also use, and which I will go into in detail in a product review or in a post on caring for my hair after I damaged it with frequent bleaching. Now I think I can say with confidence that my hair is a bit more demanding than most when it comes to conditioning, because it is naturally dry, thick, frizzy and generally resembles an uncooperative Brillo pad. I like to wear my hair curly, leaving it to dry naturally and with some kind of anti-frizz, curl enhancing product on, or alternatively, to blow dry it (after leaving it to mostly dry naturally...it just works better that way) and then straighten it, following the application of heat-protection styling products of course! When my hair gets seriously out of condition, I can't manage to do either thing with it, because the frizz is just too intense, but this conditioner is one sure way to calm the whole situation down, smooth away the dryness and giving a lasting softness, a kind of hair de-stressing. The conditioner does deposit a colour/stain on my bleached blonde hair, as well as my natural white hair. As you would expect, the bleached areas can hang onto the colour deposit and become a bit dull with over-use, which is why I am quite careful to not use this every time I wash, but probably every week to ten days is enough to keep my hair looking fresh and without brassiness. I leave it on for the advised time of 2-5 minutes, but the instructions say that for a deeper, stronger colour deposit, you can leave it on longer. I like the fact that it's like a special treat to use, and that I don't have to think about deep conditioning and colour toning separately. The smell is beautifully fresh, and it's a joy to use. 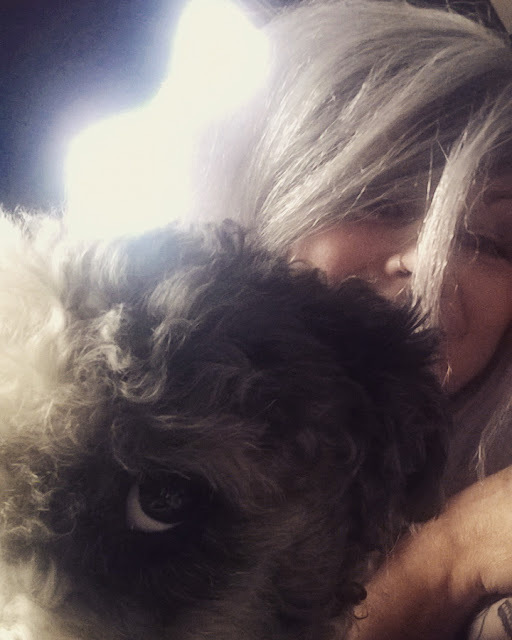 Some years ago, I had a bit of a hair bleaching disaster, courtesy of a salon, I might add, not even by my own fair hands! Anyway, a combination of repeated highlights and a horrible yellow orange effect on some of them, left me with frazzled, dry hair in awful condition. During this time, I started using Aveda Blue Malva as a styling product on dry hair, to soften it and tone down both the frizz and the brassy colour. I still sometimes use it as a spot treatment for styling my fringe which can look yellow in comparison to the rest of my hair. I know this isn't how Aveda intended the product to be used, and it definitely wouldn't work for everyone...but if your hair is really thick and unruly or needing a lot of TLC along with some colour toning, you might like to give it a try. I purchase mine from my local Aveda salon, you can click here to find your local salon, and maybe they will do like mine does, and have a loyalty card scheme where you get £10 off after you've purchased a certain number of products. I have also purchased from Aveda online here which was really satisfying as the delivery was quite fast and I got to choose some free samples to try as well. The current price for the conditioner is £22 for 8.5floz /250ml, which in my opinion is great value, because even I don't need to use masses of product, it goes a long way, and has lasted literally months, and the results are so, so good. The last Aveda order I made was ten months ago now, and unbelievably the products are still not finished...and I have a LOT of hair, so I'm really pleased to have found such a brilliant, cruelty free way of caring for my hair. This blog post is not sponsored. It contains links which are NOT affiliate links. Affiliate links mean that the blogger receives a small percentage of any purchase made. It does not mean that you pay more, and it helps bloggers to keep on blogging. All views and recommendations are my own and genuine.